USAF F-104Cs saw service during the Vietnam War, and F-104A aircraft were deployed by Pakistan briefly during the Indo-Pakistani wars. Republic of China Air Force F-104s also engaged the People's Liberation Army Air Force over the disputed island of Kinmen. A set of modifications produced the F-104G model, which won a NATO competition for a new fighter-bomber. The ultimate production version of the F-104 was the F-104S all-weather interceptor designed by Aeritalia for the Italian Air Force, and equipped with radar-guided AIM-7 Sparrow missiles. An advanced F-104 with a high-mounted wing, known as the CL-1200 Lancer, did not proceed. The project was cancelled at the mock-up stage in favor of other lightweight fighters such as the F-16. A total of 2,578 Starfighters were eventually produced, mostly by NATO members. The F-104 served with the air forces of over a dozen nations The operational service of the Starfighter ended with its retirement by the Italian Air Force in May 2004, some 46 years after its introduction in 1958 by the USAF. The poor safety record of the Starfighter brought the aircraft into the public eye, especially in Luftwaffe service. The subsequent Lockheed bribery scandals surrounding the original purchase contracts caused considerable political controversy in Europe and Japan. Clarence "Kelly" Johnson, the chief engineer at Lockheed's Skunk Works, visited Korea in December 1951 and spoke with fighter pilots about what sort of aircraft they wanted. At the time, the U.S. pilots were confronting the MiG-15 with F-86 Sabres, and many of the American pilots felt that the MiGs were superior to the larger and more complex American design. The pilots requested a small and simple aircraft with excellent performance. On his return to the United States, Johnson immediately started the design of just such an aircraft. In March, his team was assembled; they studied several aircraft designs, ranging from small designs at 8,000 lb (3,629 kg), to fairly large ones at 50,000 lb (23,680 kg). The L-246 remained essentially identical to the L-083 Starfighter as eventually delivered. Picture: Detail of F-104G's J79 turbojet exhaust (the red coloring has been added by the museum). pylon under each wing, allowing for a maximum of nine. Picture: Lockheed F-104A-20-LO of the 83rd Fighter Interceptor Squadron at Taeyan Air Base, Taiwan, on 15 September 1958, during the Quemoy Crisis (Operation Jonah Able). The F-104A initially served briefly with the USAF Air Defense Command / Aerospace Defense Command (ADC) as an interceptor, although neither its range nor armament were well-suited for that role. 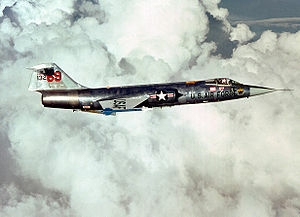 The first unit to become operational with the F-104A was the 83rd Fighter Interceptor Squadron on 20 February 1958, at Hamilton AFB, California. After just three months of service, the unit was grounded after a series of engine-related accidents. The aircraft were then fitted with the J79-3B engine and another three ADC units equipped with the F-104A. The USAF reduced their orders from 722 Starfighters to 155. After only one year of service these aircraft were handed over to ADC-gained units of the Air National Guard, although it should be noted that the F-104 was intended as an interim solution while the ADC waited for delivery of the F-106 Delta Dart. The subsequent F-104C entered service with Tactical Air Command as a multi-role fighter and fighter-bomber. The 479th Tactical Fighter Wing at George AFB, California, was the first unit to equip with the type in September 1958. Although not an optimum platform for the theater, the F-104 did see limited service in the Vietnam War. Again, in 1967, these TAC aircraft were transferred to the Air National Guard. Lockheed F-104A-15-LOs in flight with Lockheed EC-121. Commencing with the Operation Rolling Thunder campaign, the Starfighter was used both in the air-superiority role and in the air support mission; although it saw little aerial combat and scored no air-to-air kills, Starfighters were successful in deterring MiG interceptors. 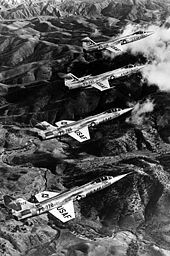 Starfighter squadrons made two deployments to Vietnam, the first being from April 1965 to November 1965, flying 2,937 combat sorties. During that first deployment, two Starfighters were shot down by ground fire. One was shot down by a Chinese MiG-19 (Shenyang J-6) when the F-104 strayed over the border, and two F-104s were lost to a mid-air collision associated with that air-to-air battle. The 476th Tactical Fighter Squadron deployed to Vietnam in April 1965 through July 1965, losing one Starfighter; and the 436th Tactical Fighter Squadron deployed to Vietnam in July 1965 through October 1965, losing four. The last use of the Starfighter in US markings was training German pilots for the Luftwaffe, with a wing of TF-104Gs and F-104Gs based at Luke Air Force Base, Arizona. Although operated in USAF markings, these aircraft (which included German-built aircraft) were owned by Germany. They continued in use until 1983. On 13 January 1967, four Republic of China (Taiwan) Air Force F-104G aircraft engaged a formation of 12 MiG-19s of the People's Liberation Army Air Force over the disputed island of Kinmen. Two MiG-19s were claimed shot down with one F-104 also lost. At dawn on 6 September 1965, Flight Lieutenant Aftab Alam Khan in an F-104 claimed a Dassault Mystère IV destroyed over West Pakistan and another damaged, marking the start of aerial combat in the Indo-Pakistani War of 1965. It is claimed as the first combat kill by any Mach 2 aircraft, and the first missile kill for the Pakistan Air Force. Indian sources dispute this claim. The PAF lost one F-104 Starfighter during the 1965 operations, scoring two kills in return. 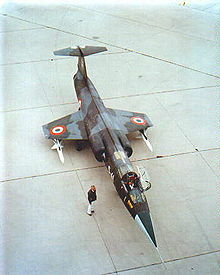 However, one of the F-104 Starfighter's victims was an Alize aircraft which belonged to the Indian Navy, which was shot down when a Starfighter was returning home from an aborted mission. The Starfighter was also instrumental in intercepting an Indian Air Force Folland Gnat earlier, on 3 September 1965. F-104s were vectored to intercept the Gnat flying over Pakistan, returning to its home base. The F-104s, closing in at supersonic speed, caused the Gnat pilot to lower the undercarriage and land at a nearby disused Pakistani airfield to surrender. The Indian AF claims Squadron Leader Brij Pal Singh (who later rose to be an Air Marshal) made a navigation error that led him to land on the Pakistani airstrip. Singh was taken as a POW and later released. The IAF Gnat is now displayed at the PAF Museum, Karachi. During the Indo-Pakistani War of 1971, four F-104As were lost in combat against the IAF MiG-21s. One pilot successfully ejected from his F-104 over shark-infested waters, but was never found. According to Western military analysts, the Indian MiG-21s had clearly "won" the much anticipated air combat between the MiG-21 and the F-104 Starfighter. Picture: Federal German Air Force F-104G displayed at the Deutsches Museum. Picture: German F-104G reconnaissance displayed in on the air base in Schleswig, Schleswig-Holstein. At the same time that the F-104 was falling out of U.S. favor, the Luftwaffe/Federal German Air Force was looking for a foreign-designed multi-role combat aircraft to operate in support of a missile defence system.The Starfighter was presented and reworked to convert it from a fair-weather fighter into an all-weather ground-attack, reconnaissance and interceptor aircraft, as the F-104G. This was chosen over the English Electric P.1, Grumman Super Tiger and Northrop N-156. The aircraft found a new market with other NATO countries, and eventually a total of 2,578 of all variants of the F-104 were built in the U.S. and abroad for various nations. Several countries received their aircraft under the U.S.-funded Military Aid Program (MAP). The American engine was retained but built under license in Europe, Canada and Japan. The Lockheed ejector seats were retained initially but were replaced later in some countries by the statistically safer Martin-Baker zero-zero ejection seat. The Class A mishap rate(write off) of the F-104 in USAF service was 26.7 accidents per 100,000 flight hours as of June 1977, (30.63 through the end of 2007), the highest accident rate of any USAF Century Series fighter. By comparison, the rate of the F-102 Delta Dagger was 14.2/100,000 (13.69 through 2007), and the mishap rate for the F-100 Super Sabre was 16.25 accidents per 100,000 flight hours. The introduction of a highly technical aircraft type to a newly reformed air force was fraught with problems. Many pilots and ground crew had settled into civilian jobs after World War II and had not kept pace with developments, with pilots being sent on short "refresher" courses in slow and benign-handling first generation jet aircraft. Ground crew were similarly employed with minimal training and experience. Operating in poor North West European weather conditions (vastly unlike the fair weather training conditions at Luke AFB in Arizona) and flying at high speed and low level over hilly terrain, a great many accidents were attributed to controlled flight into terrain or water, (CFIT). Luftwaffe losses totaled 110 pilots. Many Canadian losses were attributed to the same cause as both air forces were primarily operating over West Germany. An additional factor was that the aircraft were parked outside in adverse weather conditions (snow, rain etc.) where the moisture affected the delicate avionic systems. It was further noted that the Lockheed C-2 ejection seat was no guarantee of a safe escape and the Luftwaffe retro-fitted the much more capable Martin Baker GQ-7A seat from 1967, and many operators followed suit. 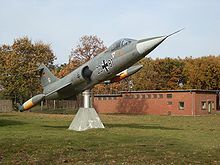 In 1966 Johannes Steinhoff took over command of the Luftwaffe and grounded the entire F-104 fleet until he was satisfied that problems had been resolved or at least reduced. In later years, the German safety record improved, although a new problem of structural failure of the wings emerged. Original fatigue calculations had not taken into account the high number of g-force loading cycles that the German F-104 fleet was experiencing, and many airframes were returned for depot maintenance where their wings were replaced, while other aircraft were simply retired. Towards the end of Luftwaffe service, some aircraft were modified to carry an ADR or "black box" which could give an indication of what might have caused the accident. Erich Hartmann who had commanded one of Germany's first jet fighter-equipped squadrons and was a former World War II fighter ace  had deemed the F-104 to be an unsafe aircraft with poor handling characteristics for aerial combat and had judged the fighter unfit for Luftwaffe use, even before its introduction, to the dismay of his superiors. Picture: A Lockheed YF-104A, 55-2961, NASA number 818. First NASA flight on 27 August 1956, last operational flight on 26 August 1975 – 1,439 flights over this period. A total of 153 initial production versions were built. 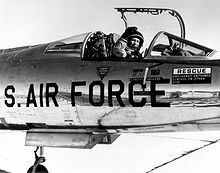 In USAF service from 1958 through 1960, then transferred to ANG until 1963 when they were recalled by the USAF Air Defense Command for the 319th and 331st Fighter Interceptor Squadrons. Some were released for export to Jordan, Pakistan, and Taiwan, each of whom used it in combat. In 1967 the 319th F-104As and Bs were re-engined with the J79-GE-19 engines with 17,900 lbf (79.6 kN) of thrust in afterburner; service ceiling with this engine was in excess of 73,000 ft (22,250 m). In 1969 all the F-104A/Bs in ADC service were retired. On 18 May 1958, an F-104A set a world speed record of 1,404.19 mph (2,259.82 km/h). Picture: F-104C at the National Museum of the United States Air Force, Wright-Patterson AFB, OH. 1,122 aircraft of the main version produced as multi-role fighter bombers. Manufactured by Lockheed, and under license by Canadair and a consortium of European companies which included Messerschmitt/MBB, Dornier, Fiat, Fokker and SABCA. The type featured strengthened fuselage and wing structure, increased internal fuel capacity, an enlarged vertical fin, strengthened landing gear with larger tires and revised flaps for improved combat maneuvering. Upgraded avionics included a new Autonetics NASARR F15A-41B radar with air-to-air and ground mapping modes, the Litton LN-3 inertial navigation system (the first on a production fighter) and an infrared sight. 220 combat-capable trainer version of F-104G; no cannon or centerline pylon, reduced internal fuel. One aircraft used by Lockheed as a demonstrator with the civil registration number L104L, was flown by Jackie Cochran to set three women’s world speed records in 1964. This aircraft later served in the Netherlands. 246 Italian versions produced by FIAT, one aircraft crashed prior to delivery and is often not included in the total number built. Forty planes were delivered to the Turkish Air Force and the rest to the Italian Air Force (Aeronautica Militare Italiana). The F-104S was upgraded for the interception role having NASARR R-21G/H radar with moving-target indicator and continuous-wave illuminator for SARH missiles (initially AIM-7 Sparrow), two additional wing and two underbelly hardpoints (increasing the total to nine), more powerful J79-GE-19 engine with 11,870 lbf (53 kN) and 17,900 lbf (80 kN) thrust, and two additional ventral fins for increased stability. 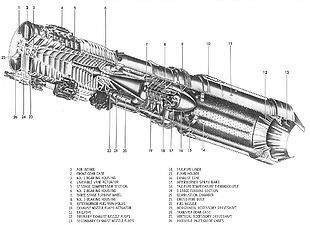 The M61 cannon was sacrificed to make room for the missile avionics in the interceptor version but retained for the fighter-bomber variants. Up to two Sparrow; and two, theoretically four or six Sidewinder missiles were carried on all the hardpoints except the central (underbelly), or seven 750 lb (340 kg) bombs (normally two–four 500-750 lb/227–340 kg). The F-104S was cleared for a higher maximum takeoff weight, allowing it to carry up to 7,500 lb (3,400 kg) of stores; other Starfighters had a maximum external load of 4,000 lb (1,814 kg). Range was up to 780 mi (1,250 km) with four tanks. - RCAF CF-104A, RCAF s/n 12700 is on display at the Canadian Aviation Museum, Ottawa, Ontario, Canada. - RCAF CF-104, RCAF s/n 104783 is on display at the Atlantic Canada Aviation Museum. - USAF F-104A is on display at Robins Air Force Base, Georgia, United States. - USAF F-104A, AF Ser. No. 56-780 (formerly 56-779), is on display at Cavanaugh Flight Museum, Addison, Texas. - NASA F-104A, N818NA, is hanging from the ceiling of the Smithsonian's National Air and Space Museum in Washington, D.C.
- F-104A is on display at the Pakistan Air Force Museum, in Karachi, Pakistan. - USAF F-104C, AF Ser. No. 56-0934 is on display at the Museum of Flight in Seattle, Washington. - USAF F-104C, AF Ser. No. 56-0914, is on display at the National Museum of the United States Air Force at Wright-Patterson AFB in Dayton, Ohio. - F-104C, AF Ser. No. 57-0916, is on display at the Virginia Air & Space Center in Hampton, Virginia. - F-104D, AF Ser. No. 57-1314 is on display at the Castle Air Museum at the former Castle AFB in Atwater, California. - F-104D, AF Ser. No. 57-1331 is on display at the Air Force Armament Museum, at Eglin AFB, Florida. - F-104G, Royal Danish Air Force s/n R-771, is displayed at the entrance to Flyvestation Aalborg, Aalborg, Denmark. - F-104G, R-756, is displayed outside at the Midland Air Museum, Coventry, England. - GAF F-104G, Luftwaffe s/n 22+35, is on display at Lasham airfield, England, 2006. - GAF F-104G, Luftwaffe s/n 22+58, is preserved at the "Traditionsgemeinschaft JaboG-34", in Memmingen, Germany. - GAF F-104G, Luftwaffe s/n 20+47, is on external display at the Internationales Luftfahrtmuseum, Manfred Pflumm, in Villingen-Schwenningen, Germany. - GAF F-104G, Luftwaffe s/n 25+74 (painted as MFG1 22+22) is on external display at the Deutsches Marinemueum in Wilhelmshaven, Germany. - F-104G is on static display at the Middle East Technical University, Ankara, Turkey. - F-104G cn 7118 22+40 is on display at the Musée de l'Air et de l'Espace, Le Bourget Airport, Paris, France. - GAF F-104G Starfighter, Luftwaffe s/n 26+23, is preserved at the Air Museum of Spain, in Madrid, Spain. 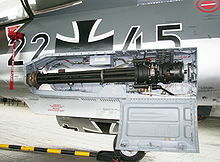 The aircraft is an ex-Luftwaffe machine which retains its German markings on the left side but is unusually painted with Spanish markings on the right side. - F-104G is on static display at The Air Victory Museum, South Jersey Regional Airport, Lumberton, New Jersey (Painted as RNLAF s/n "D-8090" but is actually ex-Belgian Air Force s/n FX-81). - RNLAF F-104G, Royal Netherlands Air Force s/n D-8331, is on static display in the Science Museum Oklahoma in Oklahoma City, Oklahoma. - JASDF F-104J, s/n 36-8515 is preserved on display at Kakamigahara Aerospace Museum, Kakamigahara, Japan. - JASDF F-104J, (cn 3052) s/n 36-8552 is preserved on display in the Family Spot Park in Chichibetsu City near Hokkaido AFB, Japan. - NASA F-104N, N811NA, flown by Neil Armstrong, is on static display at the Embry-Riddle Aeronautical University Prescott, Arizona campus. - NASA F-104N, N812NA, is on display at Lockheed Palmdale, Calif. "Skunk Works" facility. Stock footage of F-104s was used when a U.S. Air Force F-104 intercepted the USS Enterprise in the Star Trek first season episode, "Tomorrow is Yesterday". In the remastered version of the episode, the stock footage was replaced by Computer-Generated Imagery. An F-104G Starfighter in the guise of an NF-104A was featured in the 1983 film The Right Stuff. The 1964 movie The Starfighters, about the training and operations of F-104 crews was subsequently featured in episode #612 of Mystery Science Theater 3000. The film starred future US Congressman Robert Dornan. 1. a b Knaack 1978. 2. F-104 Starfighter, NASA, 1 February 2005. 3. Matricardi 2006, p. 129. 4. a b Bowman 2000, p. 26. 5. Bowman 2000, p. 32. 6. a b Bowman 2000, p. 28. 7. a b c d e f g h i j Donald, David, ed. "Lockheed F-104 Starfighter". The Complete Encyclopedia of World Aircraft. Barnes & Nobel Books, 1997. ISBN 0-7607-0592-5. 10. Bowman 2000, p. 39. 11. Thompson 2004, p. 155. 12. Smith and Herz 1992. 13. Thompson 2004, p. 157. 15. Two Cs from the 435th Retrieved: 6 February 2008. 17. Fricker and Jackson 1996, p. 74. 18. Bowman 2000, p. 165. 19. Jagan and Chopra, 2006. 20. a b Claims and Counter Claims, Pakdef.info. Retrieved: 6 February 2008. 21. "Indian Air Force: Down the Memory Lane." Indian MoD. Retrieved: 29 July 2008. 22. Coggins, Ed. Wings That Stay on. Turner Publishing Company, 2000. ISBN 1563115689, 9781563115684. 25. "The Lockheed Mystery." Time, 13 September 1976. Retrieved: 6 February 2008. 26. Bowman 2000, pp. 40, 43. 27. Fricker and Jackson 1996, p. 92. 28. Fricker and Jackson 1996, p.78. 29. Fricker and Jackson 1996, p.97. 31. a b Bowman 2000, p. 21. 34. Jenkins 2005, p. 46. 35. Drendel 1976, p. 22. 37. "Too gung-ho." New Scientist, Vol. 199, No. 2666, 26 July 2008, p. 17. 38. Reed 1981, p. 46. 39. Weal 1995, p. 164. 40. Toliver and Constable 1985, pp. 285–286. 41. Kropf 2002, Ch. 10. 42. Matricardi 2006, p. 130. 44. Bowman 2000, Appendix II. 45. Starfighters F-104 Demo Team web site Retrieved: 6 February 2008. 46. Baugher on See 5303 (104633), civil registry: N104JR , "Lockheed CF-104D Starfighter", American Military Aircraft, 20 January 2003. Retrieved: 24 February 2009. 47. "Lockheed F-104A Starfighter." Canada Aviation Museum. Retrieved 10 March 2009. 48. "RCAF CF-104." Atlantic Canada Aviation Museum. Retrieved 26 September 2009. 49. "USAF F-104A." museumofaviation.org. Retrieved: 7 December 2009. 50. "USAF F-104A,." cavanaughflightmuseum.com. Retrieved: 7 December 2009. 51. "F-104A." Pakistan Air Force Museum. Retrieved: 7 December 2009. 52. "F-104A." Pakistan Air Force Museum. Retrieved: 7 December 2009. 53. "Collections » Aircraft » Lockheed F-104C." The Museum of Flight. Retrieved: 10 March 2009. 54. "Aircraft on Exhibit." Wings Over the Rockies Air & Space Museum. Retrieved: 7 December 2009. 55. 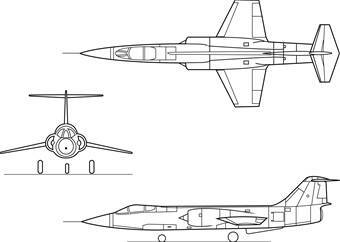 "Lockheed F-104C Starfighter Fact Sheet." National Museum of the USAF. Retrieved: 18 May 2008. 56. "F-104C." vasc.org. Retrieved: 7 December 2009. 57. "Lockheed F-104D Starfighter." Castle Air Museum. Retrieved: 10 March 2009. 58. "F-104D." Air Force Armament Museum. Retrieved: 7 December 2009. 59. On loan from the USAF Museum. 60. "F-104G." Midland Air Museum. Retrieved: 6 February 2008. 61. "GAF F-104G." Luftfahrt Museum: Second World War Aircraft Preservation Society Retrieved: 6 February 2008. 62. "Project restoration of a Starfighter." F104G.de. Retrieved: 7 December 2009. 63. "F-104 Display." 916-starfighter.de. Retrieved: 7 December 2009. 64. Flugplatz-Scwenningen.de "F-104G (in German language)." flugplatz-schwenningen.de. Retrieved: 22 October 2008. 65. "F-104G." Jetjournal-Gallerie.net. Retrieved: 17 March 2009. 66. "GAF F-104G." 916-starfighter.de. Retrieved: 7 December 2009. 67. "F-104 Starfighter photos on METU campus." metu.edu.tr. Retrieved: 7 December 2009. 68. "F-104G." 916-starfighter.de. Retrieved: 7 December 2009. 69. "F-104G Starfighter, 26+23." 916-starfighter.de. Retrieved: 22 October 2008. 70. "F-104G on static display." Wreckhunters.be. Retrieved: 22 October 2008. 71. "RNLAF F-104G." International F-104 Society. Retrieved: 22 October 2008. 72. Kakamigahara Aerospace Museum Retrieved: 12 April 2008. 73. "JASDF F-104J." i-f-s.nl. Retrieved: 7 December 2009. 74. "Where Are They Now? The NASA Dryden Flight Research Center's Historic Aircraft." NASA/Dryden Flight Research Center, October 8, 2008. Retrieved: 7 December 2009. 75. "F-104N." Airliners.net. Retrieved: 22 October 2008. 76. Loftin, LK, Jr. Quest for Performance: The Evolution of Modern Aircraft. NASA SP-468 Quest for Performance Retrieved: 22 April 2006. 77. Bashow 1990, p. 93. Quote: "...just buy an acre of land anywhere in Germany, Sooner or later..."
78. a b Bashow 1986, p. 16. 79. Cold Lake Airforce Museum, Cold Lake Airforce Museum. - Bashow, David L. Starfighter: A Loving Retrospective of the CF-104 Era in Canadian Fighter Aviation, 1961-1986. Stoney Creek, Ontario: Fortress Publications Inc., 1990. ISBN 0-919195-12-1. - Bashow, David L. "Starwarrior: A First Hand Look at Lockheed's F-104, One of the Most Ambitious Fighters ever Designed!" Wings Vol. 16, no. 3, June 1986. - Bowman, Martin W. Lockheed F-104 Starfighter. Ramsbury, Marlborough, Wiltshire, UK: Crowood Press Ltd., 2000. ISBN 1-86126-314-7. - Donald, David, ed. Century Jets. Norwalk, Connecticut: AIRtime Publishing, 2003. ISBN 1-880588-68-4. - Drendel, Lou. F-104 Starfighter in action, Aircraft No. 27. Carrollton, Texas: Squadron/Signal Publications, 1976. ISBN 0-89747-026-5. - Fricker, John and Paul Jackson. "Lockheed F-104 Starfighter". Wings of Fame. Volume 2 1996., p. 38-99. Aerospace Publishing. London. ISBN 1-874023-69-7. - Higham, Robin and Carol Williams. Flying Combat Aircraft of USAAF-USAF (Vol.2). Manhattan, Kansas: Sunflower University Press, 1978. ISBN 0-8138-0375-6. - Hobson, Chris. Vietnam Air Losses, USAF, USN, USMC, Fixed-Wing Aircraft Losses in Southeast Asia 1961–1973. North Branch, Minnesota: Specialty Press, 2001. ISBN 1-85780-115-6. - Jackson, Paul A. German Military Aviation 1956-1976. Hinckley, Leicestershire, UK: Midland Counties Publications, 1976. ISBN 0-904597-03-2. - Jagan, Mohan P.V.S. and Samir Chopra. The India-Pakistan Air War of 1965. New Delhi: Manohar, 2006. ISBN 81-7304-641-7. 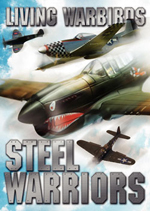 - Jenkins, Dennis R. "Hun Heaven, The Super Sabre Dance." Wings Magazine, Vol. 35 No. 12, December 2005. - Käsmann, Ferdinand C.W. Die schnellsten Jets der Welt (German language) Planegg 1994 ISBN 3-925505-26-1. - Kinzey, Bert. F-104 Starfighter in Detail & Scale. Blue Ridge Summit, Pennsylvania: TAB books, 1991. ISBN 1-85310-626-7. - Kropf, Klaus. German Starfighters. Hinckley, Leicestershire, UK: Midland Counties Publications, 2002. ISBN 1-85780-124-5. - Matricardi, Paolo. Aerei militari: Caccia e ricognitori Volume 1. Milano, Mondadori Electa, 2006. NO ISBN. - Nicolli, Ricardo. "Starfighters in the AMI". Air International Volume 31, No. 6, December 1986, pp. 306–313, 321–322. - Pace, Steve. Lockheed F-104 Starfighter. Oscela, Wisconsin: Motorbooks International, 1992. ISBN 0-87938-608-8. - Pace, Steve. X-Fighters: USAF Experimental and Prototype Fighters, XP-59 to YF-23. St. Paul, Minnesota: Motorbooks International, 1991. ISBN 0-87938-540-5. - Reed, Arthur. F-104 Starfighter – Modern Combat Aircraft 9. London: Ian Allan Ltd., 1981. ISBN 0-7110-1089-7. - Sgarlato, Nico. "F-104 Starfighter" (in Italian). Delta editions, Great Planes Monograph series, February 2004. - Smith, Philip E. and Peggy Herz. Journey Into Darkness: the Gripping Story of an American Pow's Seven Years Trapped Inside Red China During the Vietnam War. New York: Pocket Books, 1992. ISBN 0-671-72823-7. - Stachiw, Anthony L. and Andrew Tattersall. CF104 Starfighter (Aircraft in Canadian Service). St. Catharine's, Ontario: Vanwell Publishing Limited, 2007. ISBN 1-55125-114-0. - Thompson, J. Steve with Peter C. Smith. Air combat manoeuvres. Hersham (Surrey), Ian Allan Publishing, 2008. ISBN 978-1-903223-98-7. - Thompson, Warren. "Starfighter in Vietnam". 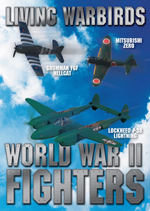 International Air Power Review. Volume 12, Spring 2004. Norwalk, Connecticut, USA: AirTime Publishing. 2004. ISBN 1-880588-77-3. - Upton, Jim. Warbird Tech - Lockheed F-104 Starfighter. North Branch, Minnesota: Specialty Press, 2003. ISBN 1-58007-069-8. - USAF Class A mishap rates through the end of 2007. Kirtland AFB, NM: USAF Safety and Inspection Center, 2007. - van der Zeeuw, Ton. "Lockheed F-104G Starfighter." Vliegend in Nederland 2 (in Dutch). Eindhoven, Netherlands: Flash Aviation, 1987. 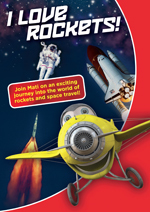 ISBN 978-90-71553-03-5. - Weal, John. "Jagdeschwader 'Richthofen': Phoenix Twice Risen". Wings of Fame, Volume 1, 1995. 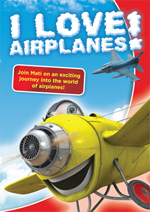 London: Aerospace Publishing, pp. 142—165. ISBN 1-874023-68-9.